We are both instructors who trained at i-SKY, The International School of Kundalini Yoga in the UK. We share the same philosophy, outlook and yogic way of life. 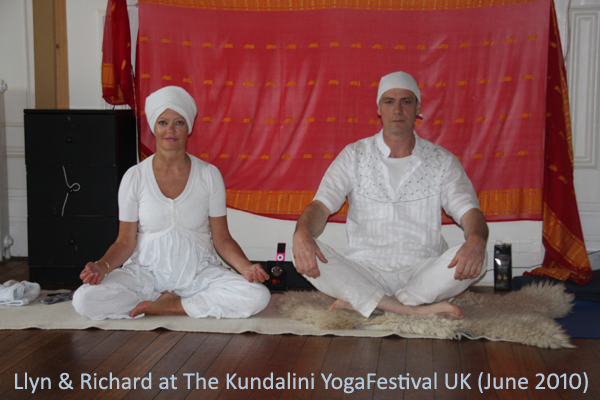 We therefore decided to share our strengths and energies to bring you Kundalini Yoga for all. Llyn, whose Spiritual Name is Livtar Kaur completed her Level 1 - Kundalini Yoga and Meditation Training in August 2009, with i-SKY. She has completed 3 Level 2 modules and is an intern with i-SKY, training new Kundalini Yoga teachers. She is also qualified to teach Yoga to children of all ages and was trained by Gurudass Kaur Khalsa through Childplay Yoga; she currently teaches one class a week. She holds two Kundalini Yoga classes a week for Adults, as well as providing Kundalini Yoga workshops for all. Ian, whose Spiritual Name is Livtar Singh completed his Level 1 training in May 2011, with i-SKY. He has completed two Level 2 modules and has started Kundalini Yoga Therapy Training with Guru Dharam Singh Khalsa. He holds one Kundalini Yoga class a week for Adults, and one class a week for children.